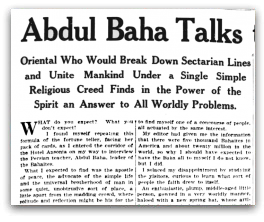 Perhaps the most prominent social message that ‘Abdu’l-Bahá brought to the West was the need for international peace, which he called “the most momentous question of this day.” While much of the popular discussion involved the political requisites to peace, ‘Abdu’l-Bahá focused on social and spiritual issues, linking universal peace with such topics as women’s suffrage, a world tribunal, collective security, the necessity of religious unity and the need for justice. 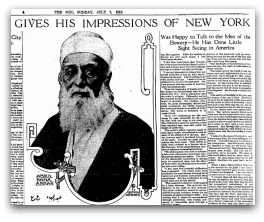 In 1912, the leadership of Europe was quietly preparing for war even as it publicly celebrated peace. 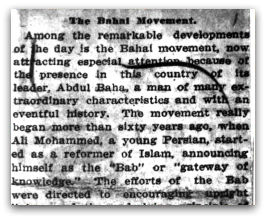 An international movement for peace was gaining supporters from all levels of society. 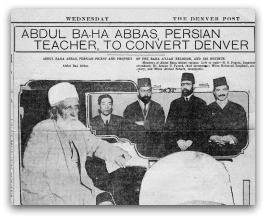 Political leaders and influential thinkers were all involved in a movement that represented a ground-swell of interest in world peace, with publications, conferences and facilities, several of which were visited by ‘Abdu’l-Bahá during his travels. 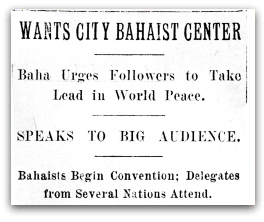 While there were many who foresaw the war, and some like ‘Abdu’l-Bahá who recognized in the Balkans a “world-enkindling fire,” the scope of the violence and tragedy of World War I was a shock to the entire world. 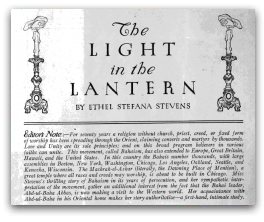 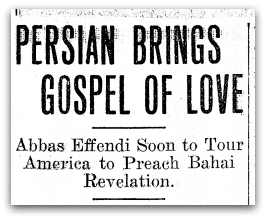 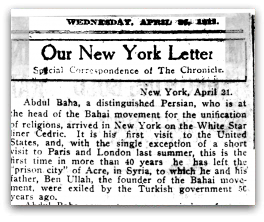 News headlines often hailed ‘Abdu’l-Bahá in terms such as the “Apostle of Universal Peace and Brotherhood,” the “Persian Peace Advocate,” the “Prophet of Peace” and similar appellations. 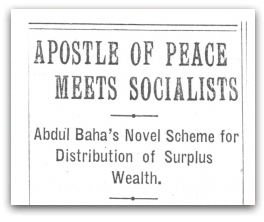 He spoke of the need for peace and the means of its achievement, not only to the conferences and groups devoted to that cause, but also in churches, to socialist groups, public gatherings and individuals, whether famous and influential or completely unknown. 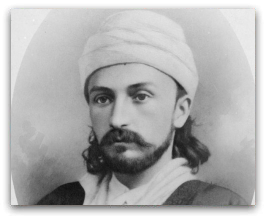 “The one whose heart is purest, whose life and character are highest and nearest to the divine standard is most worthy and excellent in the sight of God. 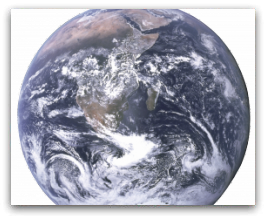 This is the only true and real distinction, be that one man or woman. 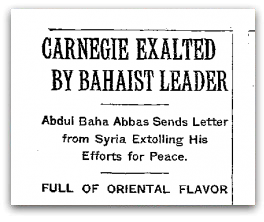 One of the issues that ‘Abdu’l-Bahá most often linked with international peace was the education and advancement of women, saying that “when women participate fully and equally in the affairs of the world, when they enter confidently and capably the great arena of laws and politics, war will cease; for woman will be the obstacle and hindrance to it.” He even stated that “the education of women is of greater importance than the education of men,” as they are the first educators of the children. 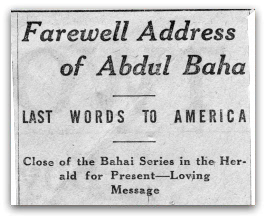 In the course of the journey, ‘Abdu’l-Bahá interacted with several women who were already on their way to becoming leaders in the international peace movement, and spoke at the Hull House in Chicago, which was founded by Jane Addams, perhaps the most famous woman in the peace movement.